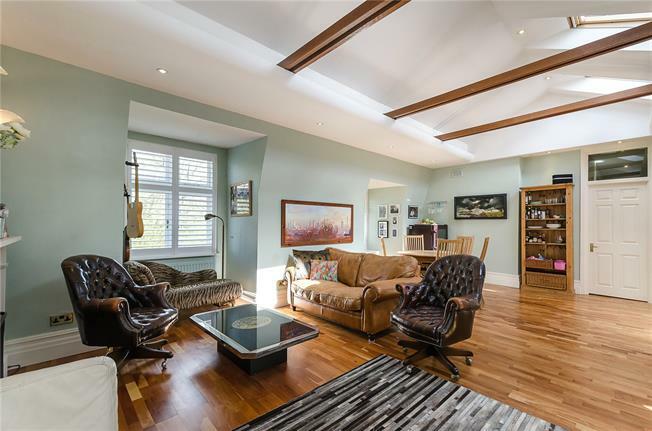 A truly special Hampstead apartment on the top floor of this prestigious mansion building set alongside Hampstead Heath, offering a light and airy accommodation of 3 bedrooms with use of stunning communal gardens & parking. The reception room is beautiful with a vaulted ceiling, rich wooden floors and tasteful decor. The positioning of the kitchen allows for a semi open-plan lifestyle or can be kept separate as preferred. The bedrooms are charming, with the third room currently used as a child’s room which could serve equally well as a study. The stunning bathroom has been cleverly designed to provide a walk-in shower as well as a separate bath. There is also an additional storage area within the building for this apartment. This landmark building has lovely grounds with gated parking and occupies a position on the very edge of the Heath, giving instant access to the acres of green open spaces. The Village, with an array of boutiques, cafes and restaurants is to hand as with Hampstead's overground and underground train stations.